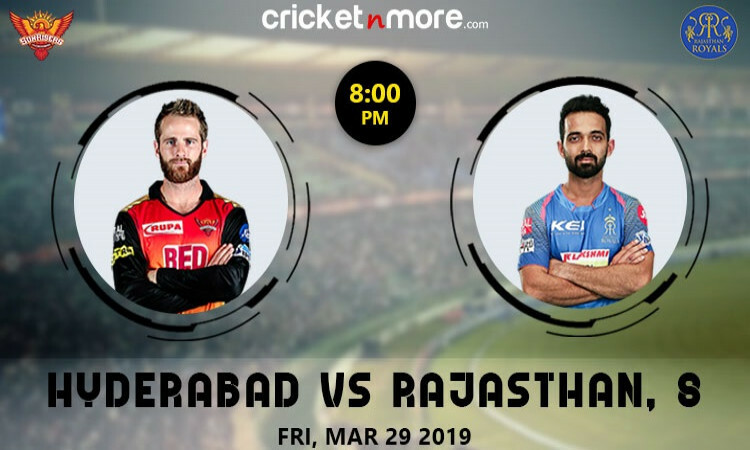 Hyderabad, March 28 (CRICKETNMORE) Having lost their opening game against Kolkata after dominating most of the match, Sunrisers Hyderabad will look to come back strongly against Rajasthan Royals at the Rajiv Gandhi International Stadium in Uppal on Friday. Even though KXIP skipper R. Ashwin's decision to ‘Mankad' RR batsman Jos Buttler shifted the focus from the game, what needs to be remembered is how the Royals' batsmen failed to score 39 runs in the last four overs -- a walk in the park in the T20 format -- when you have wickets in the bag. All eyes will also be on SRH's regular skipper Kane Williamson and his recovery from injury. While he missed the first game and Bhuvneshwar Kumar led the team, the Kiwi is expected to be fit for their first home game.